Last night, after weeks of irregular appearances on SmackDown Live, even though she is the reigning women’s champion, we see Asuka in a match. Not against Mandy Rose, Sonya Deville, or even Naomi or Carmella. No. The woman standing across from her in the ring is Charlotte Flair. What’s more, it’s for the SmackDown Women’s Championship. The booking is odd, because Flair is already booked to be in the main event at WrestleMania 35, competing for the Raw Women’s Championship against the winner of the 2019 women’s Royal Rumble, Becky Lynch, and Raw Women’s Champion Ronda Rousey. Smart money and smart booking would dictate that Asuka would get the win, while looking strong and getting a warm-up before she finds out who will face her at WrestleMania later that night, right? Wrong. 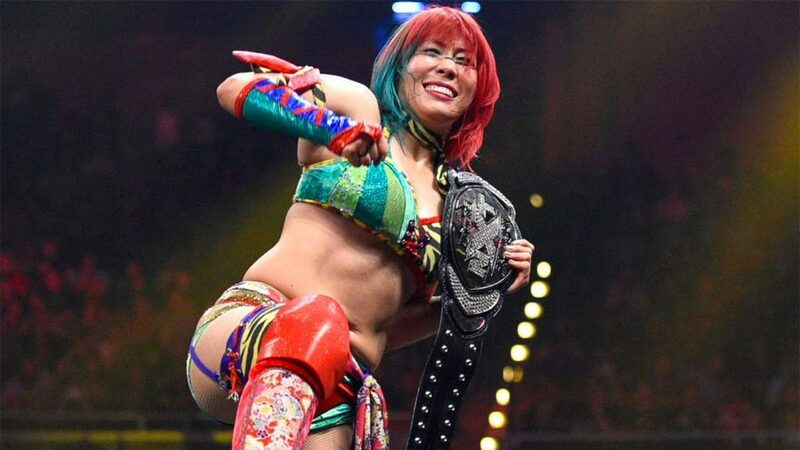 In a well-received match, Asuka lost her title, and in the new McMahon Era, automatic rematches are null and void, leaving Asuka up the creek without a paddle. However, this scenario isn’t new to Asuka. Let’s go back to 2015. When Asuka first debuted, she was treated and seen as a big deal. She was the woman who put Dana Brooke in over five submission holds in under two minutes. She was the one who steamrolled through Emma, Nikki Cross, Cameron, Ember Moon, Bayley, a returning Mickie James, Nia Jax, The IIconics, and Eva Marie. She went on to become the NXT Women’s Champion for a record 510 days. After that, and an injury, Asuka was to make her way to the main roster undefeated in a blaze of glory on Sep. 6, 2017. Beating Goldberg’s undefeated streak (175-0), and surpassing former women’s champion Rockin’ Robin’s 502-day reign with the WWF Women’s Championship. She left NXT as a star, she had mystique and a charisma very seldom seen in WWE quite the way she had it, and fans knew she was in for big things on the main roster, with it only being a matter of time before she captured a championship. Asuka picked up right where she left off on NXT, when she made her main roster debut against Emma on Oct. 22, 2017, at TLC. She went through women on the main roster in similar fashion to what she did at NXT. She tore through women left-and-right, notching up victories against the likes of Alexa Bliss, Alicia Fox, and Brooke, again. She was the sole survivor at Survivor Series for the Raw Women’s Tag Team, besting a two-on-one situation against Tamina and Natalya. She put her streak against Sasha Banks in a well-received match on Raw, and won the women’s 2018 Royal Rumble on, beating 29 other women, many of whom were returning legends, to face the champion of her choosing at WrestleMania 34. Instead, she was overshadowed by a debuting Rousey. Eventually, after a number of weeks, Asuka chose Flair, who is undoubtedly one of the best in the world, as her opponent. The question started creeping in: “Would Asuka lose to Charlotte?”. We don’t see the Empress of Tomorrow on WWE television for a month after her loss, and in her absence, she is drafted to SmackDown, officially now part of their roster. Her first act is to save the woman she was beaten by at WrestleMania from the hands of the IIconics and Carmella, the Smackdown Women’s Champion, at that time. When Asuka was announced by Paige to be Carmella’s next challenger, after watching her defeat Flair twice, fans assumed her days as champion were numbered, but that wasn’t the case. Instead, with the help of James Ellsworth, she got her first pinfall loss at Money In The Bank, in June, then inexplicably lost again the following month. Asuka was seemingly on the track back to relevance and dominance, but instead she was left looking weak by being defeated and pinned by a competitor who appeared much weaker than she. 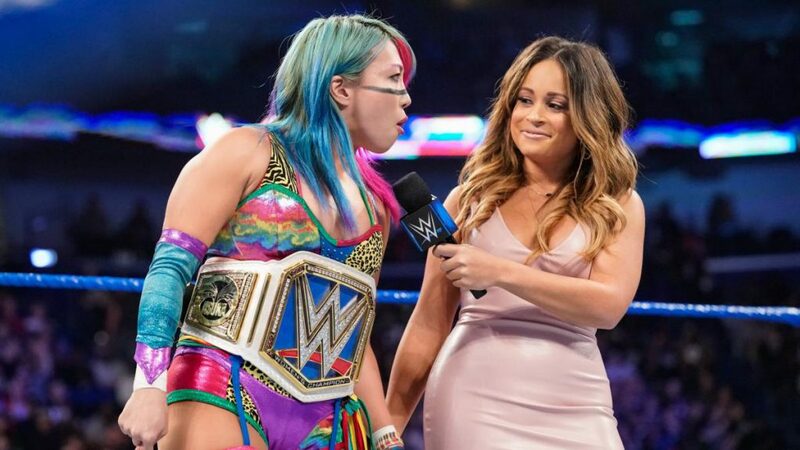 After those two defeats, in the summer of 2018, Asuka inexplicably disappeared from WWE television, prompting fans to start the #WheresAsuka? trend on Twitter. Jokes were bandied that she was with Naomi in catering, but the fact that one of the biggest stars in the women’s division went m.i.a. for about two months hardly went unnoticed, affecting her relationship with the audience. The fans were cooled on her character now. She didn’t command the pops she use to get, and wrestling fans and experts went to forums and Twitter, expressing their beliefs that they felt she had lost a lot of credibility. It was noted that she hadn’t hit rock bottom, but she needed some rehabilitation; something she seemed to be getting when WWE’s Mixed Match Challenge came around, until she was eliminated by eventual winners Fabulous Truth. She would tag with Naomi, for the most part. She lost for her team at Survivor Series, and it seemed like Asuka would be doomed to the fate of Shinsuke Nakamura. Then, hope glimmered upon her, and she won a battle royal to put herself into the TLC match for the SmackDown Women’s Championship. To the happiness of many, she won. This meant to many fans that Asuka would return to dominance and prominence, but that wasn’t the case. Asuka started off strong, beating Naomi in a good, competitive match two days after her title win, and staved-off a challenge from Lynch at the Royal Rumble event. After beating Lynch, who was the hottest star at the time, fans thought that bigger and better things would await Asuka, but they didn’t. She was shunted to the side, and not used for weeks at a time, while the challengers for the Raw Women’s Championship had segments, fights, and attacks on her show. She was the champion of her brand, but she was back to “catering”. We had not seen her for weeks, and then she would pop-up and enter into a feud with Rose and Deville. Asuka scored sketchy wins over both ladies, which only made her wins look like flukes. Gone was the dominant Asuka, and her in place was a woman who couldn’t put away Rose without a mistake on her part. This is the same woman who luckily beat Deville, both of whom she would have destroyed in NXT and would have easily dispatched of in 2017. Her character’s mystique and “take no prisoners”, “toy with you before I destroy you”, aura was all but gone. Much like with Carmella, she was wrestling against someone who wasn’t as seasoned as her in the ring. Women with less experience were made to look like they really stood a chance against Asuka, dominating the middle portion of their matches. That is not to knock Rose, or Carmella, but the style of matches they faced Asuka in hurt Asuka, more than helped her. Last night, Asuka was still not a part of a real storyline, and as of two weeks before WrestleMania, had no challenger. Enter Flair, who challenges her and takes her title, just like that. 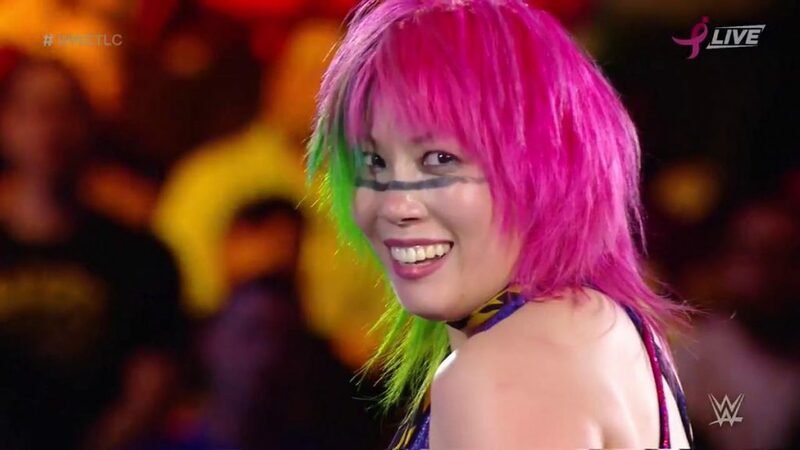 In the past year, fans witnessed Asuka going from top of the heap to a side character and an afterthought. Her daft, shoddy booking by WWE has left a sour taste in many fans’ mouths. Her loss at WrestleMania 34 was the shake-up in her character the fans felt she needed. However, it became her undoing. Since her match at last years’ “Show of Shows”, Asuka was not on WWE television for approximately five-and-a-half months. The crowd cooled on her, diehard fans despaired, and when she seemed to be back it the catbird’s seat, she was unceremoniously taken off TV, or saddled with unbeneficial busy work. Many fans on Twitter are angry with Flair for taking the title off of Asuka, but Flair is a symptom of the overall problem. The WWE’s lack of foresight, planning, and ability to book simple storylines let this happen. They muddied the waters in what should have been a straightforward angle for Lynch. They made Naomi and Rose’s angle nonsensical. They ruined Bayley for over a year, and they made Banks look like a joke as a champion. The reason why this era still could not live up to the Golden Era is not because of match quality; this era outpaces them easily. Where this era lacks is in character and story quality. When you saw Jazz, you know you were getting someone tough as nails and could rough someone up. When you saw Molly Holly, you knew she was technically proficient and smooth in the ring. The women were involved in long-term stories. Molly and Victoria had a feud in 2004 that lasted a long while, Trish Stratus and Lita had a partnership and feud that lasted from 2003 to 2005, James and Stratus had their storyline play out from 2005 to 2006, Torrie Wilson and Dawn Marie went on from 2002 to 2003, and Stephanie and Sable had a months-long feud. All of those characters and feuds were successful because they were mapped out, the women had clear characters, and their matches and stories would play into those characters. Asuka had a defined character coming into WWE, and due to 50/50 booking and the inconcrete planning, as Banks once confirmed in a 2017 interview, Asuka has been mismanaged. There are hopes among fans that this situation with Flair will pan out and a wrong will be righted, but the issue is that WWE had no vision for Asuka, and let one of the most talented women of this generation look much less than what her caliber suggests and deserves. Do you agree Asuka is getting less than what she deserves from WWE? Let us know below.